During the CrossFit Games Open, a lot of attention is focused on the athletes who finish on top. But could we learn even more from those lower on the Leaderboard? Josh Bridges completed CrossFit Games Open Workout 14.5 in 7:49 minutes. Samantha Briggs did it in 8:31. And Cori Creran from Clifton, New Jersey, took 1 hour, 28 minutes. Is she 10 times less fit than Briggs? Or is there a chance we’ve been looking at this all wrong? Before you answer, think back for a moment to 14.5: burpees and thrusters, that diabolical combination, for 84 reps each. You probably have your own choice words for it. Awful. Horrendous. A death march from the first set to the last. Did it take you 15 minutes? It probably sucked for all 15. Thirty? Same answer. Now imagine doing it for even longer. You’re sucking wind. Quivering. Nauseated. For an hour or more. Get the picture? We celebrate the top athletes, people such as Rich Froning, Josh Bridges and Sam Briggs. We marvel at their physical prowess. We rain accolades on them. But maybe it’s time to take a good look at the athletes around you. There’s probably a Cori Creran in your box, too. 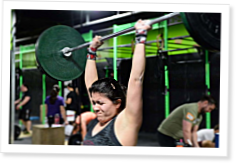 This is the fourth episode of CrossFit Radio that aired 8AM PDT on October 12th, 2008. I am humbled and inspired by Cori into trying once again to finish 14.5. I tried twice, each time getting through 18 before quitting. If I don't comment back, it means I burst into flames and died. Craig, what I have learned from doing 14.5 is that no matter how much it hurts or how long it takes, if you put your mind to it and have people that support you, you can accomplish anything! Even if you do it one rep at a time like I did, you can finish!! This is EXACTLY the spirit that made me start CrossFit and exactly the reason I continue! Amazing job Cori! THANK YOU for this article. Completely inspirational. Cori, strong work!! Of course I am impressed with the elites and their amazing times, but I am 10 times more impressed with those that seriously have to dig deep to finish a workout like that. It is what I love about CrossFit. Seeing something on the board that I'm not quite sure I can actually do and then doing it and thinking holy sh#$&, I just did that. No matter how long it takes. Really really great job, Cori! Thanks again for this well written article! Cori, plain and simple, you brought it...congrats!